Corrosion costs the transportation industry billions of dollars. It is an especially significant problem for airports, highways, ports, railways, or municipalities located in harsh coastal conditions or severe winter climates. Deteriorated infrastructure and equipment are expensive to replace and pose safety hazardsâ€”as in the case of rusting tankers or structurally deficient bridges. These costs and hazards can be significantly decreased or eliminated through effective corrosion prevention and treatment. Cortec’s capability offers environmentally friendly, highly efficient, cost effective, and easy-to-use Vapor phase Corrosion protection for municipalities and transportation applications. Vapor phase Corrosion Inhibitors (VpCIs) and Migrating Corrosion Inhibitors (MCIs) offer environmentally safe methods of treatment with low toxicity and low polluting effects. Unlike corrosion inhibiting systemsÂ of the past, many Cortec® products do not contain chromates or other heavy metals, nitrites, orÂ chlorinated hydrocarbons; Cortec® VpCI® and MCI® help turn the tables on corrosion. With the supportÂ of our corrosion scientists, engineers, and testing facility, Cortec® can provide simple, environmentally friendly solutions to corrosion problems. VpCI® and MCI® can be applied at multiple points forming continuous chemical bonds over metal surfaces. If the protective layer is scratched away, new VpCI® molecules will rush in to replenish the VpCI® shield. 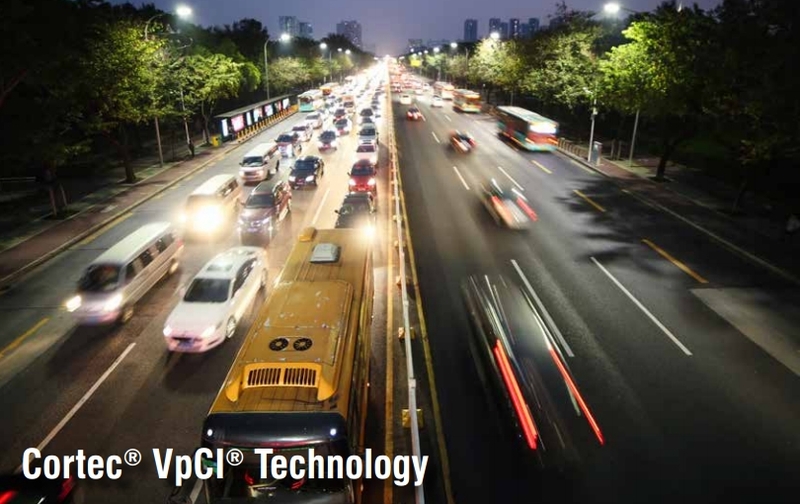 The ability of Cortec VpCI® Technology to protect in the liquid phase, vapor phase, and interface allows VpCI® molecules to travel through different media for more effective and uninterrupted protection. For example, VpCIs injected into a water system immediately go to work on pre-rusted or scaled surfaces and also protect metal above the water level. MCIs can be added directly into new concrete mixtures or applied to hardened concrete surfaces, migrating in to protect embedded rebar at both the anode and cathode. A bustling transportation system is the heartbeat of an active economic society. To keep that transportationÂ pulse healthy, vehicles, ports, roads, and bridges must be kept in good condition. This is difficultÂ when unrelenting corrosion threatens to wear away the concrete and metal structures that keep usÂ moving. CortecÂ® offers innovative solutions that inhibit corrosion, increase service life, and minimizeÂ costly replacements for a broad range of these transportation concerns. Airplanes and buses, cars and ships, trains and trucks need airports, highways, ports, and railways to function. All risk corrosion from extreme conditions such as sea salt spray, winter deicing salts, or even corrosive materials under transport making them more vulnerable. Corrosion not only devalues vehiclesand transportation infrastructure but increases safety risks, repair expenses, and replacement costs. Cortec® has VpCI® solutions for transportation corrosion on land, sea, and in air. From protecting rail crossings and train sole bars, to airplanes and floating dock gates, Cortec rust removers, coatings, vehicle washes, emitters, and powders safeguard your valuable transportation assets from multipleÂ angles. The roads and bridges that tie society together are constantly deteriorating through heavy daily use exacerbated by harsh coastal or winter environments. Many concrete and metal bridge structures are aging and nearing the end of their service life. Some are structurally deficient or functionally obsolete. Maintenance, repair, and replacement are expensive and time consuming. Cortec® stands ready to help with economical treatments that prevent rust, stop existing rust, andÂ extend the service life of roads and bridges. Cortec MCI® products are especially effective at protecting reinforced concrete from rebar corrosion.